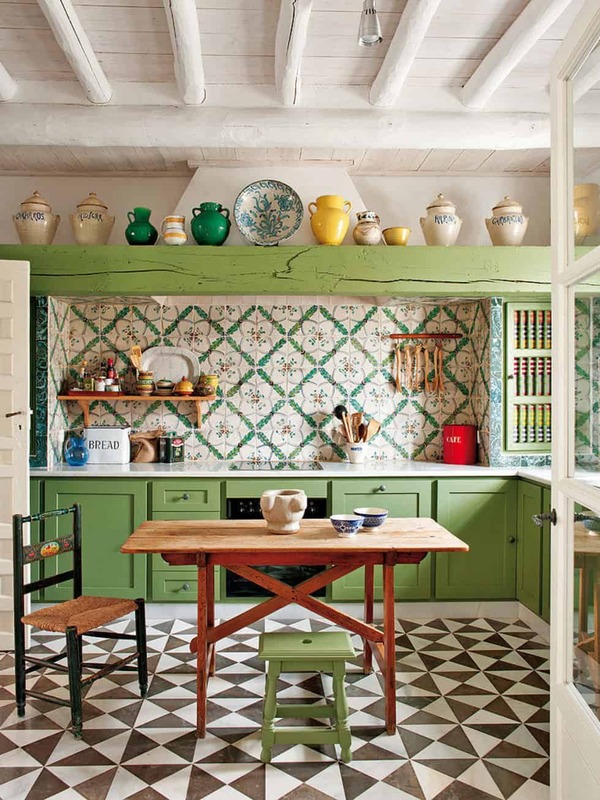 Having a green kitchen may sound a bit crazy or may make you reminisce of weekends at your grandmother’s house. Either or may be true, but green kitchens are on trend and we are all about it. So much so that we have put together a list of green kitchens that are sure to make you envy every bit of this trend. If you are not a fan of deep greens consider a moss green instead. 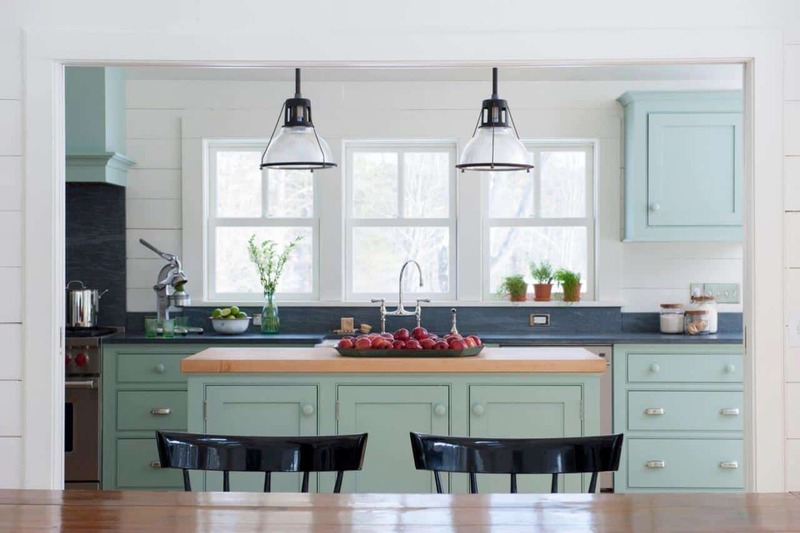 The hue is the perfect blend of a dark green with navy undertones and gray undertones plus it works well anywhere it is placed even if you do not combine it with any kitchen accents. Heres how you can achieve the look of a green kitchen without having to have a green kitchen- paint your breakfast nook a shade of green and tie the look all together with green bits in the kitchen. Consider adding a green rug to further enhance your new kitchen décor. Why only paint your kitchen cabinets green when you can paint most of your kitchen surfaces green as well. The idea is to bring a unique touch of green in a bold manner. Pair with metallic bits and/or neutrals for a well-rounded appeal. Nothing brings a kitchen back to life quite like giving your cabinets a fresh new coat of paint. Select a lighter hue for smaller kitchens that need a brightening effect. Or use a darker hue for a more elegant, edgy touch. Pair with white touches throughout the space to make the room come to life. Consider having a fresh green wallpaper, what this means is the wallpaper has some sort of natural element to it. Perhaps the pattern is a bit softer or there is a floral aspect to it. Either way a natural feel to your wallpaper will bring a classic simplicity. Wallpaper is no longer what it used to be- it used to be considered “old fashion” now its fresh and fun. The key is working with a patterned wallpaper that comes through as bold yet subtle with just the “right” amount of green. Use a green shade that has a blue undertone. 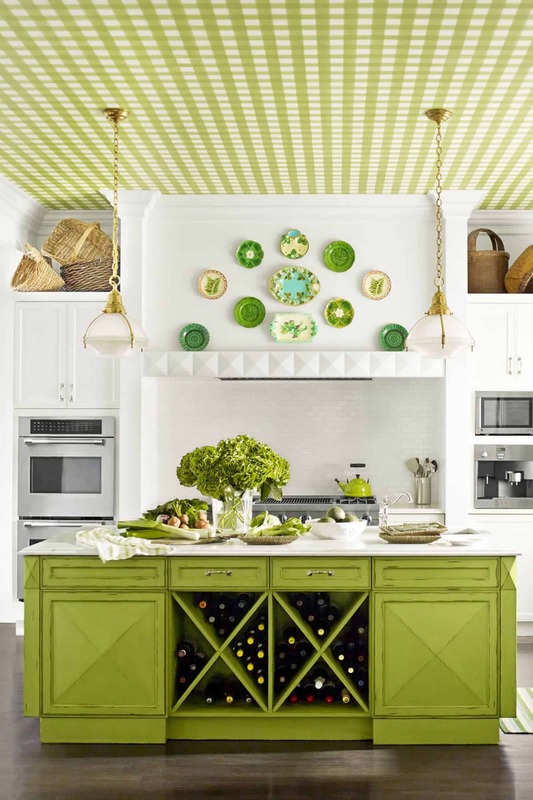 We love a classic gingham pattern anywhere in the home, especially in a simple shade of green. Pair with a bolder shade of green for a balanced look that creates a dynamic contrast. Keep the rest of the decor to a minimum for a beautiful display. Who doesn’t love the idea of gingham? We are absolute fans of this pattern because of how bold it can be. Use it as part of your ceiling décor to bring extremely high ceilings down to a level that is comfortable for your liking. Combine your gingham pattern with other green shades throughout the space to tie your décor together. 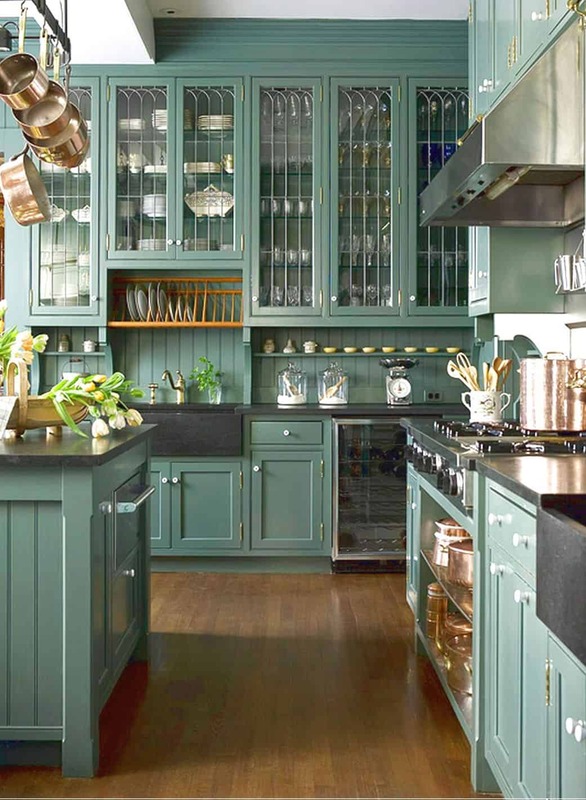 The shades of green you use could make a huge difference in the way your kitchen is displayed. 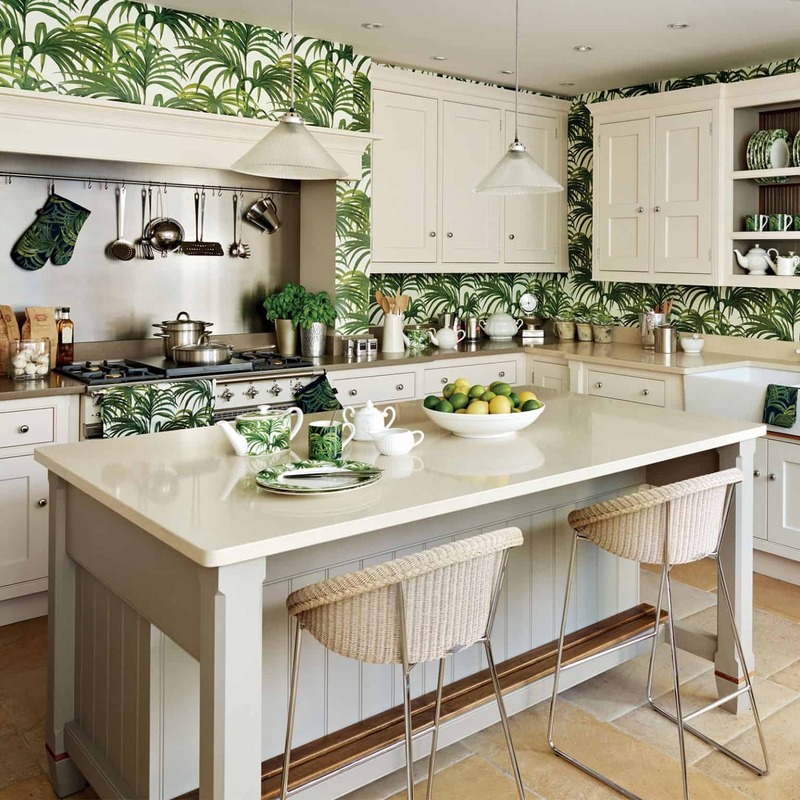 Choose a unique fun wallpaper with hints of green and then select a completely different shade of green to use throughout your kitchen space. Doing so provides a fresh contemporary feel. Sometimes, two shades of green are better than one. Select two shades that contrast each other and work them into different areas of the kitchen. Doing so brings an elevated look while still having this freshness to it that will work exceptionally well with other shades in the room. A beach house green is a different type of hue it is a mixture between a bold aqua blue and a green undertone blue. Use this hue in a bold manner around the kitchen for that daring impact that comes full circle when it is paired with darker wood elements. Beach house décor has become a top contender as it brings the summer directly to your everyday space. 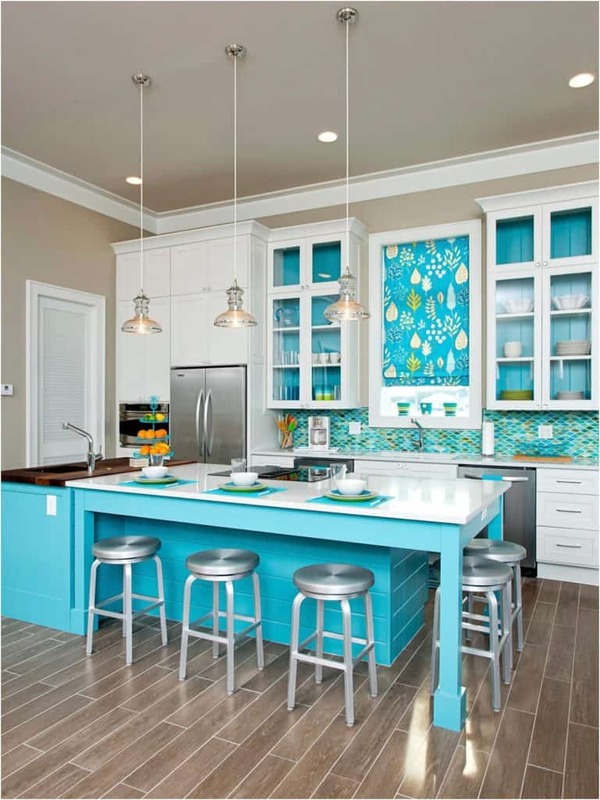 Take a turquoise hue and use it as part of your accent wall to bring a different dimension to the kitchen while still being simple. A glossy top coat added to your kitchen cabinets is an excellent form of reviving them in a simple manner, especially if you already have a forest green color as part of your cabinetry. Why have an all matte space when you can have a touch of gloss. 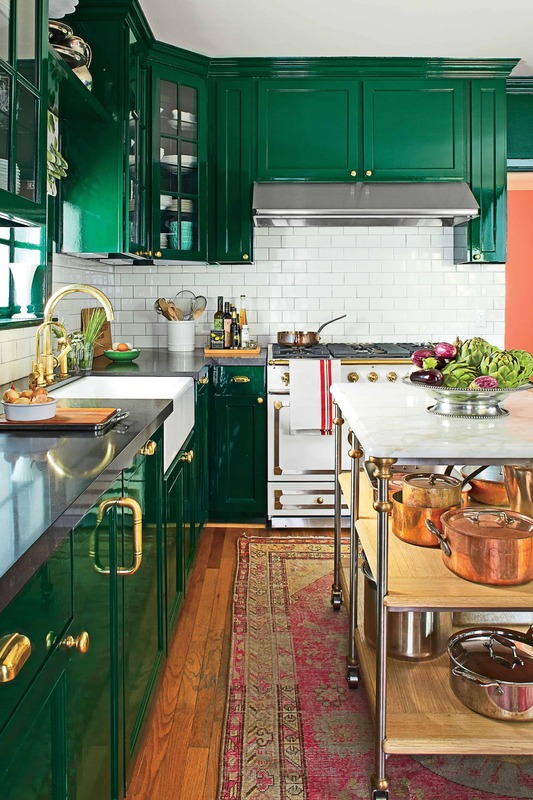 Add a glossy green to your kitchen cabinets for a contrast that brightens the space while being contemporary. The glossy effect is fun and different while still being easy to work with. Have a smaller space in your kitchen and don’t know what to do with it? 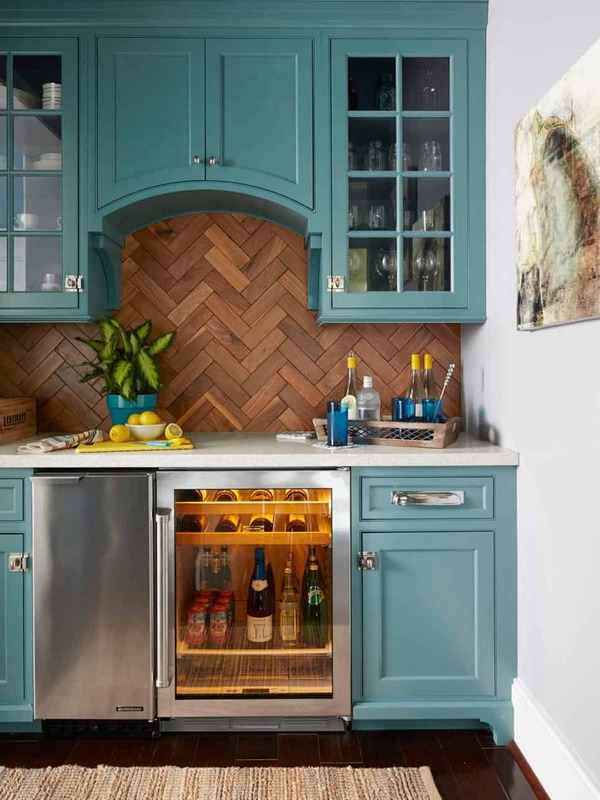 If so create a small food prep or bar station, doing so adds that fun aspect to your kitchen while giving you the excuse of painting a space in your kitchen a charming hue- arsenic green. This particular shade is one of a kind as it has hints of green yet is subtle enough for it to work well with numerous other shades- the shade sort of has a “funky” undertone that brings it to a new dimension. Depending on how you decide to decorate around it the hue appears bluer sometimes or even sort of gray. Pale green is perfect when you want that hint of green without the boldness the hue can bring. Pair it with metallics and more wood for a farmhouse aesthetics that is charming and airy while still being fun. Pale green is perfect for a kitchen island, or as part of your kitchen wallpaper. The color is a softer hue that makes sense in any setting that it is placed in. Which is why it’s a top favorite for many homeowners who desire to have that green feel without going for a bolder hue. When you first hear the words “accent chairs” you might think of bright hues. However, that is not always the case you can have soft hues of green such as a hue with gray undertones. This will work exceptionally well in an all-white space or a neutral focused area. 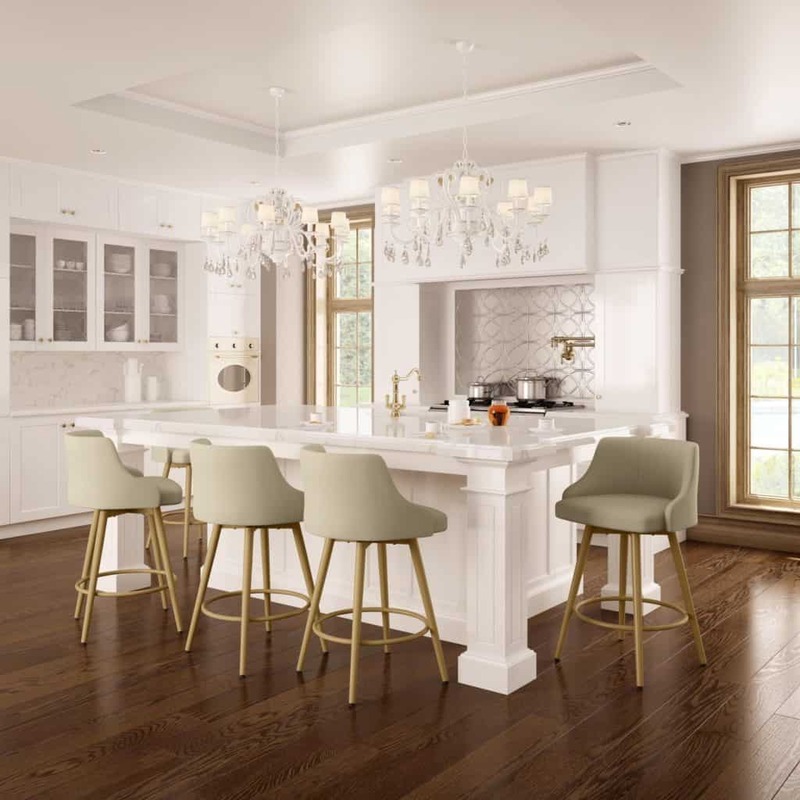 Bring the green hue to your kitchen without removing or switching up your décor simply add in accent chairs or stools at the end of your kitchen island in a rich shade of green. You may even want to consider having your desired green shade be displayed as part of your breakfast nook seating. Aqua green is such a fun color. It brings the beauty out of any room including a laidback kitchen. Pair with metallic accents to increase the green undertone in the color itself. Enjoy a blue tone green more than a vivid green? 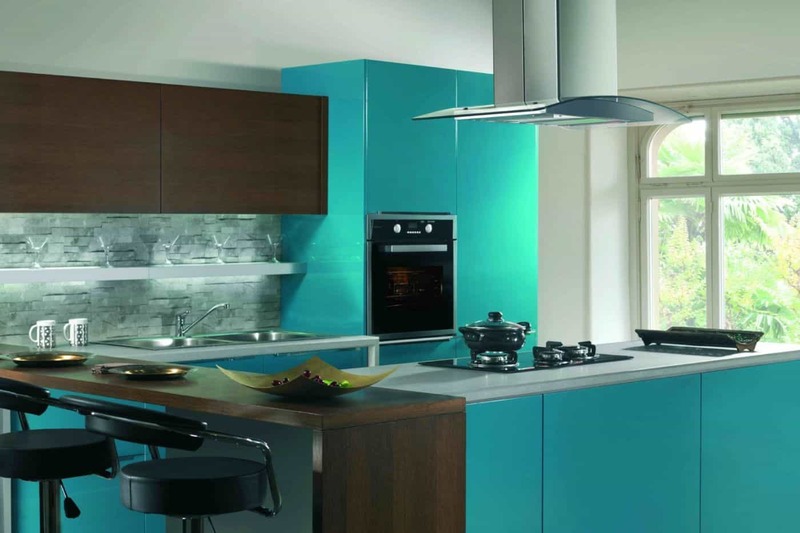 If so an aqua green shade is perfect for you. This shade itself makes the space appear larger while still providing that classic green undertone you want for a kitchen everyone will envy. Your green kitchen awaits! Which of these made you feel inspired to incorporate green into your space? Share your thoughts with us in the comments below.